Elmsdale is a carefully refurbished Victorian townhouse located in Alexandra Road, a leafy tree lined avenue running from the sea front and part of the Penzance Conservation Area. 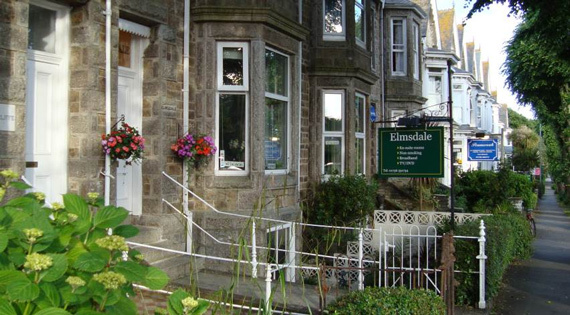 The guest house is located a short stoll from Penzance seafront and the Town centre. Guest accommodation is located on the first and second floors and comprises 4 double or twin rooms en-suite bedrooms. All rooms have flat screen TVs, DVD players, broadband internet access (wired and wireless), tea/coffee making facilities and a hair dryer. Breakfast is served in the ground floor dining room and comprises a selection of cereals, fruit juices, grapefruit segments and a range of cooked to order options including a full English Breakfast. Most special dietary needs can be catered for if notice is given.